After being served my summons, I search the Internet and found a website with a forum which helped me out, to a point. The people on the forums were telling everyone: “You need to answer the summons!” I freaked out and researched how to answer a summons and then I proceeded to answer it. That was my biggest mistake! I had no clue what I was doing and I missed the opportunity of filing a motion to dismiss, because LVNV Funding did not attach the contract or assignment with the complaint. The first thing I learned to do is Google: [YOUR STATE HERE] local court rules, or [YOUR STATE] then Civil Trial Rules. Believe it or not, everything is there in black and white. Your local court rules are the key to winning your lawsuit. Find out if any of this needs to be attached to the complaint in order to file a motion to dismiss. You also need to find out under your court rules if your court allows you to file a motion to dismiss in lieu of an answer. I didn’t know that I could file a motion to dismiss. All I received was a complaint stating I owed money and that LVNV Funding was the assignee of Providian. LVNV Funding is claiming to be the assignee of Providian and claiming I owe them money. My question is: “where is the proof?” You cannot just simply state that I owe money with no evidence to back it up. Even I knew that. That’s like someone coming to your door and telling you that you owe them money. Wouldn’t you want this person to prove it to you? You have no clue who this person is and why they are demanding money. They need to prove it. I thought that I had to answer the complaint first because the message boards kept telling everyone to answer the summons. If I had known better I would have read over my court rules and found out that in the state of Indiana, where I live, I’m allowed to file a motion To dismiss first. If the judge were to deny that motion, then I would have 10 days to respond to the summons after the denial but if the judge granted the motion, the case would be dismissed without prejudice, giving the plaintiff 10 or 20 days to amend their complaint. The above was telling me that if I was to be sued under a “contract” that the original or copy thereof, must be attached with the complaint. But again, I had no clue what I was doing so I looked all over the place to try and figure out how to answer this summons. I didn’t understand all of the legal terminology and when it came down to putting my affirmative defenses down, I was uneducated and fearful of the words so I neglected to put quite a few down. To be honest I didn’t even know what affirmative defenses were! Here was my response to the summons. Take note that each numbered paragraph pertains to the complaint. When answering this summons I had to lay down my affirmative defenses. I have learned that I should have used every single affirmative defense even if it makes no sense to me whatsoever. Every single one I find I would use in the future. I left out quite a bit the first time round because I didn’t understand what they meant and it scared me. For example, I was scared by the term ‘statute of frauds’ but you need to use it. Defendant denies the allegations contained in Paragraph 2 as there is not, nor has there ever been any agreement, written, oral or implied with Plaintiff and Defendant. Defendant claims Lack of Privity as Defendant has never entered into any contractual or debtor/creditor arrangements with Plaintiff. Plaintiff’s complaint fails to allege a valid assignment of debt and there are no averments as to the nature of of the purported assignment or evidence of valuable consideration; Plaintiff’s complaint fails to allege whether or not the purported assignment was partial or complete and there is no evidence that the purported assignment was bona fide. Plaintiff’s complaint further fails to allege that the assignor even has knowledge of this action or that the assignor conveyed all rights and control to Plaintiff. The record does not disclose this information and it cannot be assumed without creating an unfair prejudice against Defendant. Plaintiff has not proven that they are authorized and licensed to collect claims for others in the state of Indiana, solicit the right to collect or receive payment of a claim of another. The complaint fails to allege or prove that Plaintiff is licensed and has procured a bond in the state of Indiana as required per Article 11 of Title 25 of the Indiana Code. Plaintiff is barred under the Fair Debt Collection Practices Act, hereinafter called FDCPA, Section 807(2), 15 U.S.C. § 1692e(2)from collecting interest and any amount unless it is expressly authorized by the agreement creating the alleged debt or permitted by law. Plaintiff has failed to attach proper documentation to verify if such interest is allowed. Defendant claims accord and satisfaction as Defendant alleges that the original creditor accepted payment from a third party for the purported debt, or a portion of the purported debt, or that the original creditor received other compensation in the form of monies or credits from the Plaintiff. 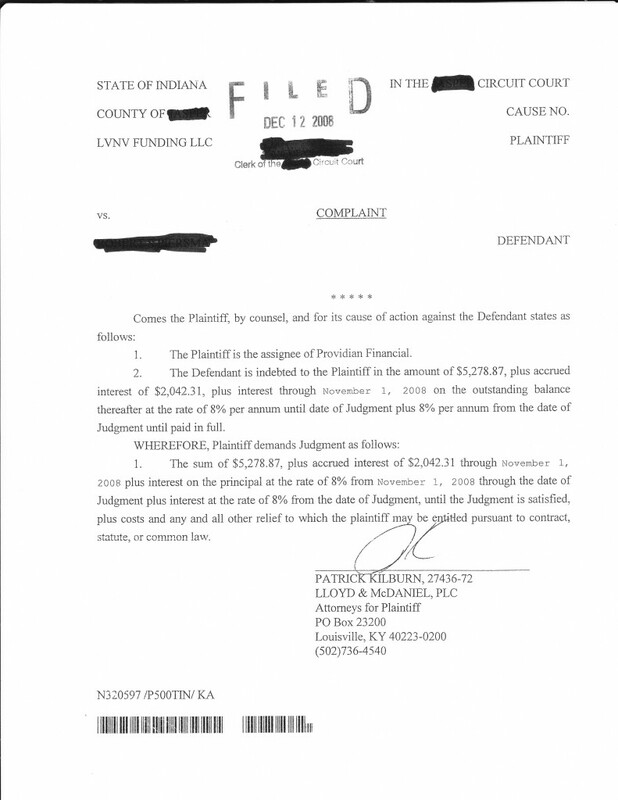 The Plaintiff has failed to reference with complaint proof of alleged assignment, original contract signed by Defendant, account numbers, accounting measures to come up with such sum of $5,278.87, accounting measures to come up with accrued interest of $2,042.31, lack of bona fide proof this alleged debt is indeed Defendant’s. The complaint does not disclose this information and it cannot be assumed without creating an unfair prejudice against Defendant. Plaintiff’s damages are limited to real or actual damages of actual cost paid or exchanged to alleged original creditor for the purported debt, for which Plaintiff failed to reference an account number in their complaint. Defendant reserves the right to plead other affirmative defenses that may become applicable and/or available at a later time. Plaintiff’s complaint is time-barred by the applicable statute of limitations on credit card debt in the state of Indiana. Plaintiff’s complaint violates the statute of frauds as the purported contract or agreement falls within a class of contracts or agreements that are required to be in writing. The purported contract alleged in the complaint was not in writing and not signed by Defendant or by some another person authorized by Defendant and who was to answer to the alleged debt, default, or miscarriage of the other person. Plaintiff is not the real party in interest and has failed to name all necessary parties. Why did I leave them out? Because I didn’t know any better and I felt quite intimidated by the meanings. Failure to state a claim upon which relief can be granted? Well, it’s simple. Plaintiff can prove no set of facts in support of his claim which would entitle him to relief. So I should have put that down! Why didn’t I put the statute of limitations defense? Because I guessed it might be within the statute of limitations. But that doesn’t matter. You see, the plaintiff is suing me so they’d have to prove this debt is within the statute of limitations, not me. I don’t have any proof. So next time, regardless, I will use that defense. That was my mistake. I saw ‘fraud’ and freaked out! However, this is the best defense in a credit card lawsuit. It is what it is. Read up on statute of frauds. It is clearly stated that a contract or agreement falls within a class of contracts or agreements that are required to be in writing. The plaintiff is not the real party in interest? I thought that it didn’t make any sense so why would I say that? Well, simply because the junk debt buyer did not prove an assignment. Meaning, they did not prove to the court nor myself that they have the right to sue me. So should I have used that? Absolutely. So that would save you many hours of figuring out those affirmative defenses, and if you leave one out, you lose the opportunity to use them. Each and every affirmative defense you put down is based on your case. You have to use every single one of them when you answer your summons or you cannot use them in the future. So live and learn. I have learned that if I’m sued in the future, I should use every single affirmative defense so I do not lose them later in the case. After I filed my answer about five days later, I received their requests for documents, requests for admissions and interrogatories. This is known as ‘discovery’. Now I had to look up how to answer all of this. Notice that in my answer to the summons, where it says “WHEREFORE”, that I put “Defendant prays that the court take nothing of Plaintiff’s complaint by virtue and dismisses the complaint”. Obviously, here in Indiana you cannot just say: “Hey, dismiss this case please”. You would have to file a motion to the court, not put into the answer. My point here is that I thought just because I put ‘dismiss the complaint’ in my answer, that it would get dismissed. I was wrong. Then LVNV came crashing down on me with discovery. Check your local court rules for interrogatories, admissions, and requests for documents to see what format you need to use and how your court allows you to answer. Do not copy mine. Remember that all courts are different.